New Jersey has a long and rich tradition of Mental Health advocacy. 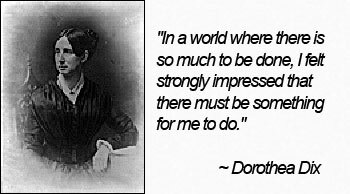 In 1837 American social reformer Dorothea Dix began a 30-year campaign to see that the mentally ill were taken out of the prisons, where many had been incarcerated. Her campaigns and successes in replacing jails and poorhouses for the mentally ill with professional care by public institutions included founding or enlarging over 30 mental hospitals in the United States and in Europe. Among those was the New Jersey State Lunatic Asylum, now known as Trenton Psychiatric Hospital. Ms. Dix referred to the hospital as her child and spent her last years living in an apartment on the hospital’s grounds. NAMI NEW JERSEY ADVOCACY – How Can You Help? Through grassroots advocacy NAMI New Jersey brings a voice to the concerns of families, friends and persons who are affected by mental illness. The strength of NAMI New Jersey grassroots advocacy comes from the collective work of our members and friends, real people who do what they can do to improve the lives of people with a mental illness. The ultimate success of our advocacy initiatives will depend on the number of people who are mobilized to make a phone call, write a letter or visit a key policy maker. Because advocates vary in the amount of time they are able to devote to these efforts, there are opportunities for people to participate for as much or as little as they are able. To learn more about how you can help, contact Phil Lubitz at advocacy@naminj.org or (732) 940-0991.